There is nothing more satisfying than a clean piano. Not only does it look great in the home with its shine, but it also means the instrument is being cared for properly. There are many types of wood finishes on pianos, but I’ve found that the ebony finish is the trickiest to clean. So, how do you clean an ebony finish piano? To clean an ebony finish piano first remove any dust with a feather duster. 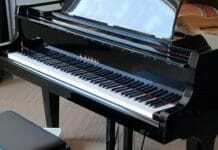 Next using a microfiber cloth, wipe the piano with a satin ebony finish polish or conditioner. The polish will help remove oils that are common with ebony finish pianos. That’s really all there is to clean the finish of an ebony finish piano. It’s important to remember that not all polishes are the same, so the spray you use really does matter. There are also some excellent homemade solutions you can use to clean the finish of a piano to remove those greasy oils. Next, I’ll share a couple of products you can use to clean your ebony finish piano as well as some other tips to keep it clean longer. A safe an efficient way to clean pianos is to use specially formulated polishes and conditioners. There are quite a few good brands out there, but I highly suggest using Cory or Music Nomad cleaning products. With Music Nomad, they have formulas that clean, polish, and wax the piano so that everything can be done in a single application. They also provide a cleaning solution that can be used specifically on the keys. Cory, on the other hand, provides cleaners and polishes in separate applications. In the case of a satin ebony finish, you will want to use their Satin Sheen polish. Cory’s satin sheen is a great way to polish an instrument. It adds a nice gloss to it, and it’s a quick and easy application. The formula helps with removing fingerprints, and also helps lift grime and smudge marks while being gentle on the piano. It can also work on poly and lacquer finishes too. While the satin sheen cleaner and conditioner is great for polishing up an instrument it does have some negatives. For example, it leaves a thin silicone layer to the finish which acts as a sealant. Over time though, if that layer becomes blotched, then it will be hard to fix it once it’s become a part of the pianos overall finish. Most piano cleaners are rather pricey for the amount of solution you get in each bottle. At most, each bottle only carries 4 fluid ounces, so they can run out quickly if you clean your piano regularly. While I do recommend Music Nomad and Cory cleaners, it may also be a good idea to add homemade cleaning solutions into the mix. Simple ingredients that you can pick up the store combined with water can make for safe and effective cleaners for an ebony finish piano. 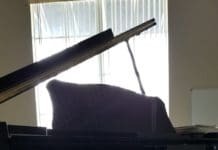 Let’s look first at how denatured alcohol can be used to help remove deep film layers on a piano and help restore it to its beautiful shine. Pianos are made up almost entirely of wood, so it’s important to use denatured alcohol. 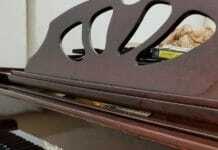 Denatured alcohol is a popular liquid used in furniture finishes. Due to its ethanol adjustment, denatured alcohol is used to remove tough grease stains and grime often found on furniture. It’s also very capable or removing mold and can also get rid of peeling wood. You’ll want to mix 2 parts water, and 1 part denatured alcohol together before using this on a piano. Alcohol is still a strong ingredient that could damage a delicate instrument, so diluting the mixture is very important. Apply a little bit at a time to a microfiber towel and wipe the finish gently. For really dirty or filmy areas of the piano, I suggest letting the solution soak on the instrument for 30 seconds before wiping. A basic solution used to clean a piano is dish soap and water. Unlike alcohol, dish soap is a lot less risky to use. 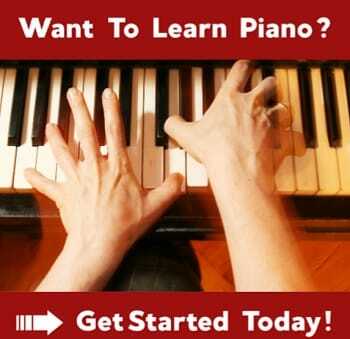 Simply create a 50/50 solution and gently rub the surfaces of the piano. Dish soap suds up well, but it won’t dissolve into the wood finish. Something like dawn with stain fighting removal works very well. I usually apply a small amount to the areas with the thickest dirt or stains and allow it to sit there so the dish soap can work its magic. When dish soap sits on stains what’s happening is both a lifting of the dirt and a sanitizing process at the same time. Letting the solution sit allows the particles to dissolve meaning you won’t need to wipe as hard to remove those stains. Most dish soaps specialize at removing heavy grease stains too. Cleaning a piano is not a complicated process, however, picking the right cleaning ingredients is possible. 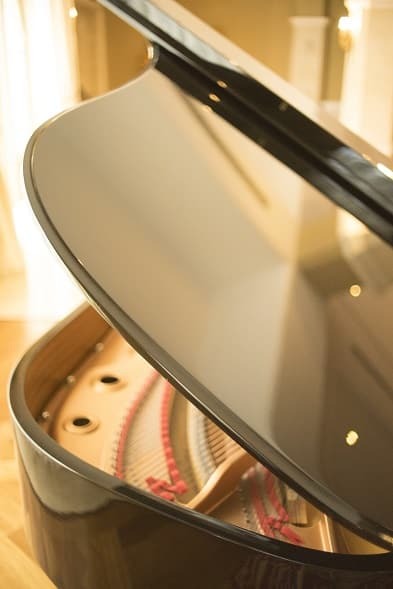 While it may seem that you can use just any old cleaner or polish on a piano, that’s simply not the case. This is the same for all of the other parts including the keyboard, strings, and pedals. Below are a few items you should never use to clean a piano. Whatever you do, never use any furniture polish on your instrument. While products like Pledge are designed to work with all types of wood, they are not intended for delicate instruments like pianos. Especially with a satin finish, Pledge will end up greasing up the entire finish of your piano. That will make it very difficult to repair once it’s settled into the finish. The spray particles from the Pledge can end up traveling to the intricate action parts inside the piano. This includes the strings, dampers, hammers, and pins. Over time those parts will start to build up from the Pledge and stick together causing even more issues. This includes things like tuning instability, rusting of the strings, wearing down of the hammers, and cracking of the internal parts like the soundboard and pin block. Most cleaning sprays like Pledge contain silicone solvents. Window spray products like Windex may work fine for polishing up tough grease spots on the keys. However, the same cannot be said for the finish of an ebony piano. Regular Windex contains ammonia which can damage the finish of your piano. Not only will it possibly leave a blue hue finish on the instrument, but it might also start to form small cracks along the surface. If you do decide to use Windex, make sure to use the ammonia free version, and use only a small amount. Also never spray Windex or other window sprays directly onto the piano. Instead, spray a small amount into the cloth and then wipe. Can I Use Pledge To Clean My Piano? You should never use Pledge to clean your piano. The chemicals in the spray may end up causing serious damage to the finish. Furniture cleaners, in general, should not be used to clean musical instruments. How Do You Dust A Piano? Ideally, before cleaning a piano you should dust it. Pianos should be dusted with a feather duster wand for the inside. The outside can be wiped down with a microfiber cloth. Soft flannel cloths work best. How To Remove Scratches From Piano? Minor scratches can be removed with a buffer polish solution. Deeper and larger scratches may need to be buffed and then recolored to the finish. Significant scratches will require assistance from a piano technician. The procedure typically takes half a day at a rate of $100 per hour.